A 46-year-old man questioned in the killings of two Texas county prosecutors remained behind bars Sunday following an arrest on charges of making a terrorist threat, the Wall Street Journal reports. 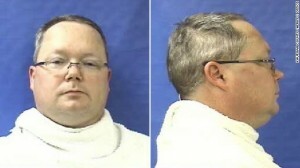 Investigators have questioned Eric Williams, a former justice of the peace, several times but authorities have not identified him as a suspect in the murder of Assistant District Attorney Mark Haase or the slayings of Kaufman County District Attorney Mike McLelland and his wife. Posted: 4/15/13 at 8:50 AM under News Story.